A native of Houston, Smith graduated from Eisenhower High School. He went on to receive a Bachelor of Arts degree in English and Political Science from Southern University. After completing over a year of law school at Thurgood Marshall School of Law, Smith realized his real purpose in life was writing and he completed his Master of Arts degree in Journalism from Texas Southern University. While covering the Essence Music Festival for Houston Forward Times in 2006, he realized there were not many publications dedicated to the educated and sophisticated African-American male. 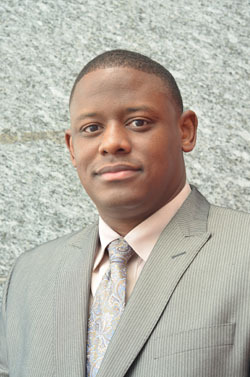 As a result, he founded the online publication Regal Magazine (RegalMag.com) in November 2006 to highlight inspirational Black men and provide a platform to address the issues confronting Black men. After finding success with RegalMag.com, Smith wanted to take RMG’s mission to a broader demographic, and the talk show “Regal Roundtable” was launched. “Regal Roundtable” is a male talk show that centers around one particular topic per episode, from religion to relationships and from sports to social issues, and allows men of all races the opportunity to speak out on the issues of the day from their own unique perspective. The show airs nationally on the video on demand network Fun TV. Now Smith is taking RMG’s message to all avenues of the media that want to hear his message of inspiration, information and enlightenment. Smith is a media personality eager to lend his voice in the forms of political commentary, sports commentary, religious commentary, social commentary, pop culture criticism, relationship advice, lifestyle advice (with an emphasis on etiquette and fashion) and motivational speaking. Smith also makes regular appearances on “Isiah Factor Uncensored” on Fox 26 and “The Pursuit of Happiness” radio show on KPRC 950 AM in Houston. And if you are serious about being inspired, informed and enlightened, then you are seriously interested in Mr. Todd A. Smith, CEO/President of Regal Media Group, LLC. To follow Smith on Twitter click here and to follow him on Facebook click here. To book Smith for any speaking engagements or media appearances, click here to submit a request.